CNN) The bomb used by the Saudi-led coalition in a devastating attack on a school bus in Yemen was sold as part of a US State Department-sanctioned arms deal with Saudi Arabia, munitions experts told CNN. Munitions experts said the numbers on this piece of shrapnel confirmed that Lockheed Martin was the maker of the bomb. If we’re not the ones murdering innocent people we’re selling the arms and everything else necessary for another country to use.on people who just want to raise their childtten in the safety of their own country.. They’re the ones who really suffer during wartime. ‘Collateral Damage’ is the term for it. And if you look at Iraq, you’ll find evidence that we”re very good creating all that damaged ‘collateral’. Someday our collective Karma is going to kick in. Anyone care to fact check a wild accusation? What CNN will never report is how allegedly Saudi Arabia was on a terrorisim list at the time and was barred from buying such weapons without getting a waiver from the Secretary Of State. Supposedly the Pay To Play list said it cost them 5 million. US-supplied bombs don't kill people. People with US-supplied bombs kill people. that this bomb killed innocent children on their way to school. The Pentagon works diligently and tirelessly to ensure the bombs, missiles and airplanes they sell to Saudi Arabia are to be used strictly for the honorable humanitarian purpose of promoting peace and stability in this region. A full investigation will be done by the Pentagon before the end of the year to find out how this unfortunate mistake occurred. plus a shiny yellow school bus for the start of the new school year in September to replace the damaged ones. More news: Employees at Lockheed Martin have come together and will donate pencil coloring sets plus a unbreakable water bottle to go with the 40 back packs. This outpouring of kindness is what makes America the greatest force for good in the world. corporate media and some in the democratic party. It's much more than just selling bombs to Saudi Arabia. The war in Yemen is actually a proxy war, just like the war in Syria is and has been a proxy war for western imperialists and Israel. In Syria the U.S. is using Al Qaeda, ISIS, and other mercenaries to do it's damage whereas in Yemen it's Saudi Arabia and company. I think the narrative that the U.S. is simply supplying weapons is meant to obfuscate that fact. The war and genocide in Yemen is happening primarily because of the U.S. imperialist agenda. gorilla in the region that pulls the Empire's strings. Edit: Upon rereading your post I see you hadn't forgotten the 800-pound gorilla. Oh, and thanks for trying to hijack my thread. Start one of your own if you want to go off on a tangent about something other than the OP why don’t you? It’s amazing the things you can find out from wiki-pedia. The price of an MK-82 bomb is $2082.50. So the next time someone asks, “what’s the value of a human life,” you can do the math and say, “$40.83”. On the other hand, it seems like such a small price compared to all the other military equipment we read about, and accountants at Lockheedless Martin probably have more sophisticated formulas to determine how many of these bombs have to be produced (and sold to authoritarian governments) to make production worth their trouble. human life so cheap, especially the lives of little children. The $2082.50 is just the base price. The average price for a complete PGM (precision-guided munition) is about $65,000. 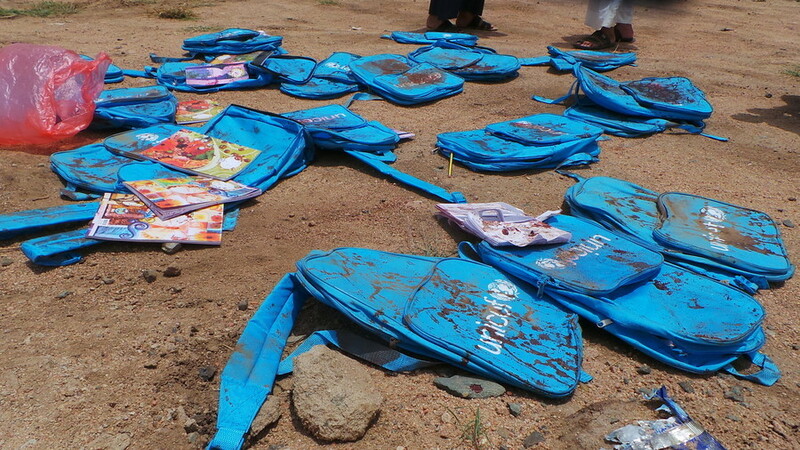 The Saudi Coalition dropped a 500-pound MK-82 bomb on a Yemeni school bus, killing 54 and wounding scores of others, mostly children. The MK-82 is an old “free fall” bomb that today is often sold with upgrade kits, making it a precision-guided munition (PGM) and thus much more accurate. If the bomb was the old-fashioned version, hitting a civilian target could be plausibly called an accident, but a guided bomb would have given the Saudis the ability to target even a moving bus. Markings recovered at the site strongly suggest that a PGM kit was part of the bomb assembly. government can stand to look at themselves in a mirror. I wonder if their conscience ever bothers them late at night while they’re lying there in the dark? I couldn’t live with myself if I had a hand in anything like this. But again, I am talking about some of the most despicable people in this country. Psychopaths do not feel empathy. are sleeping after that bomb run. They had to personally set up targeting the bus. ever square the murder of those children with their conscience. that result in the large number of PTSD cases and subsequent suicides of servicemen. The Saudi pilots would have been trained in the use of these weapons in the US by American contractors. This wanton killing of innocents in faraway lands for mostly economic greed is morally rotting the nation from the inside. The world knows it is the US and it's BFF who are ultimately responsible.